This is post #4 about the Qloud experience. The previous post was about our getting funding from Steve Case. 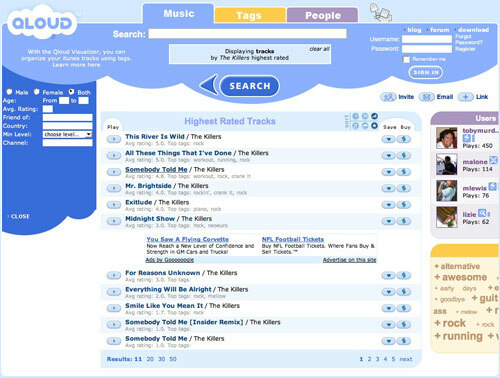 Qloud’s initial product was a music search engine. It was based on a few assumptions. Our solutions was to provide a music search engine. All existing music search engines then (and today) are based on song title and artist name. So, if you search for “dance” you’ll get Steve Miller’s “Dance Dance Dance” which isn’t actually a dance song. So, how were we going to do this? We were going to capture demographic, play counts, and tag data from users from an iTunes plugin. Then with that data, we’d allow people to search for music. You do a search like “What is the most played song tagged ‘dance’ by 24 year olds?” and we’d display the results. It was pretty damn cool. You could find lots of good music and really see the different music being played by different groups. We launch in the fall of 2006 and we were excited to see what happened. Ultimately, like many startups, we thought it was cooler than everyone else. We got thousands of users but none of them stuck or were passionate about it. Why? There was one problem – the users wanted to play the songs that we delivered. We just listed the songs and provided a 30-second preview. That wasn’t even close to being enough. Back in 2006, you couldn’t easily license full tracks of music to be played in the browser. There were a few companies (like Muse) who had 30-sec clips but nobody had full tracks. That’s what people wanted. Eventually we gave it to them, but that’s a later post. Ultimately, it was a disappointing launch and our investors started to lose faith in us and our vision. I think we were victims of not thinking large enough. We set out to solve a problem, but that problem wasn’t big enough. Providing a good music search was cool, but what people wanted was a more complete solution. We were a bit naive.